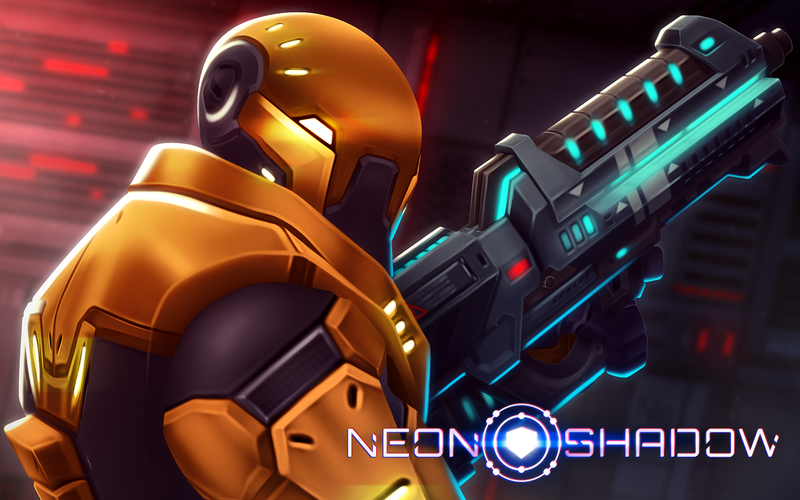 On first play, Neon Shadow feels like it hits all the right spots. It's knowingly retro, in a nod to the old school FPS' where you couldn't even jump, let alone sprint and strafe. This helped the developers, Tasty Poison, stay within the limitations of their own resources but thankfully they avoided simply cutting corners and instead sought to maximise their creativity within the scope of the game. The campaign is pretty standard FPS fare that sees you play a marine sent into a compound taken over by a malign AI. 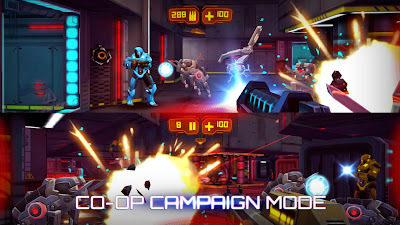 You start toting a shotgun with unlimited ammo and over the course of the campaign discover a multitude of interesting weapons, from grenade launchers to machine guns and god knows what else, with which to blow up the many enemies. Levels are linear in design, with the aim being to get to the other end and destroy a device that opens up the lift to the next stage, which is always found earlier in the level causing a mad dash back through the area as enemies spill out to fight you. Infrequent boss stages help mix things up a little also. It's all good fun but there are times when it feels like it's a game you've played a thousand times before, just with a bigger budget and the trappings and scale that goes with it. 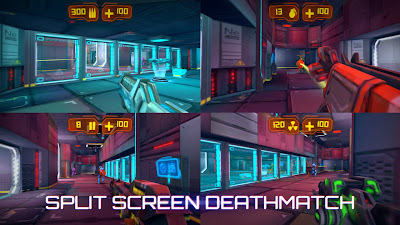 Each stage is littered with secret areas hidden behind destructible, battle-scarred wall sections that award the player with extra weapons, ammunition and health in addition to improving the rank awarded on completion of the level. However, with no online leaderboards, the ranking system is a pretty superfluous aspect of the game. 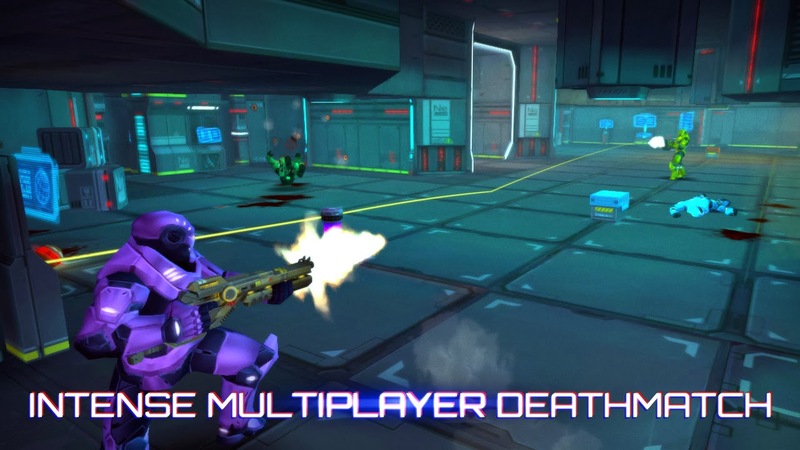 Online multiplayer is one of Neon Shadow's biggest selling points. Relatively few Ouya games offer it and as nice as a focus on couch multiplayer is, you simply cannot survive as a platform these days without offering some form of online play. Online matches will put you up against other Ouya owners as well as iOS and Android players, although even with this combined pool of potential sparring partners you may have to wait around a few minutes to find enough players for a game, even then the match will rarely fill up. Nonetheless, it's a solid, lag-free experience and it's a fair amount of fun even with just a few of you, though it can drag on if it is reduced to just two of you slugging it out. For $4.99 though, there's little to complain about here. Graphically it's one of the more polished titles on the Ouya and the level design is solid and entertaining, particularly when you shoot the device at the end of each level and have to dash back to reach the lift. It is worth noting that the iOS and Android versions both contain all the features of the OUYA version but are available to buy at just £0.69/$0.99. This is not uncommon for a cross-platform mobile/console game, and is an ongoing topic of discussion over on the Ouya forums. Generally speaking it's considered acceptable practice due to the smaller market (and therefore likelihood of monetary return) of the Ouya but it's worth pointing out nonetheless. 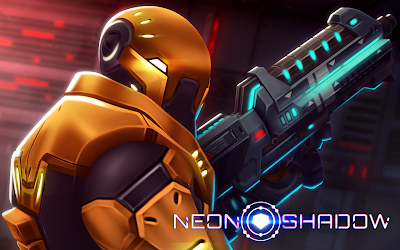 In all honesty, if Neon Shadow had been released on any other platform it may have gotten lost in the mix. It's the perfect fit for the Ouya not just because there is a dearth of original FPS games but also because the marketplace is not nearly as crowded as the Playstation Network or Xbox LIVE Arcade. Consequently it stands out more. It doesn't break any new ground, nor does it try to. 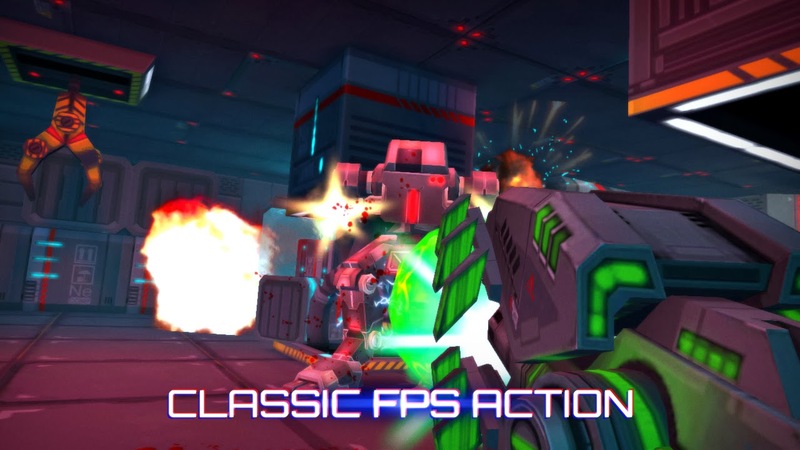 It was created to offer a solid, retro-inspired FPS experience with local and online multiplayer. At that, it succeeds handsomely and comfortably finds itself among a slowly increasing number of must-have titles for Ouya owners. Download the demo/purchase the Android version here (from Google Play Store). It's so refreshing to play an arcade-style FPS that was initially designed with local multiplayer in mind yet still has a really well designed and enjoyable single player campaign. The beautiful textures and general art direction makes the game really shine, and with its deceptively low-poly models, even when a horde of droids blasting at you Neon Shadow never seems to stutter. The inclusion of score multipliers for combined or chained kills also works surprisingly well, elevating the game above it's old-school peers and resulting in an experience that feels well-suited towards speed runs and competitive play. Despite it's simple control scheme, Neon Shadow plays far better on the Ouya than on a mobile phone or tablet - having tactile physical controls makes a world of difference. 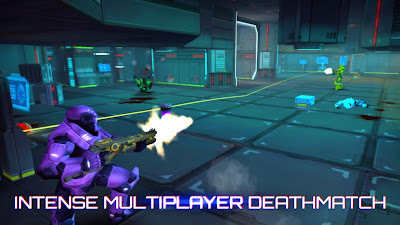 I doubt it'll end up being ported to other consoles or desktop machines, but with it's finely tuned Doom-style no-nonsense run 'n' gun gameplay, I'd be surprised if it didn't find a fanbase there as well. Definitely a highlight of the Ouya catalogue.